Wikipedia lists more facts about this uber-young hockey star than we’d uncover researching him the old-fashioned way, so why bother? According the website, his best friend is Jack Johnson. He likes the band 3 Doors Down and actors Vince Vaughn and Eva Mendes. He always puts his equipment on right side first and no one is allowed to touch his stick after it’s taped. 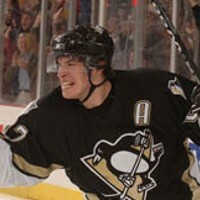 What Wikipedia fails to report is Crosby’s second win in the Best Male Athlete category. Who writes these things anyway?